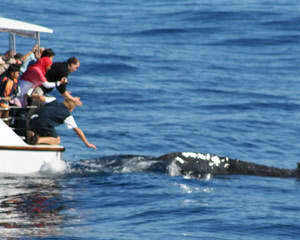 Join the longest Whale Watching Cruise on the Gold Coast, departing from the heart of Surfers Paradise. Experience Humpback Whales, Bottlenose Dolphins and Giant Loggerhead Turtles at close quarters! After a brief safety induction, you'll commence your tour with a scenic canal cruise through the Nerang River. Gaze at the amazing architecture as our knowledgeable crew point out the spectacular homes of the rich and famous. Your cruise continues past beautiful South Stradbroke Island to the nearby waters of the Australian Whale Sanctuary. Have your camera ready to snap the Humpback Whales, Bottlenose Dolphins, Giant Loggerhead Turtles, Killer Whales and various Sea Birds which call these waters home. Allow 3.5 hours for your experience. 100% daily sightings record (guaranteed sightings or free return cruise). Our crew have over 10 years whale watching experience and are dedicated to providing you with the closest whale encounters possible. What makes this cruise Unique? The trip was great. Grandchildren loved the whale watching and the staff were so very helpful and explained everything so even our five year grandson could understand and enjoy. Whales In Paradise - I'm disabled so was a bit worried about getting on & off the boat, etc. The staff made it hassle-free and were wonderful. From start to finish the whole experience was fantastic. I had a ball & absolutely everyone I dealt with was helpful & professional. I'd recommend this adventure to anyone. I will certainly be doing it again.